Most Roast questions use the Bedford scale to systematically analyze indoor conditions and ensure unbiased responses. Visual consistency makes it easier to take surveys. 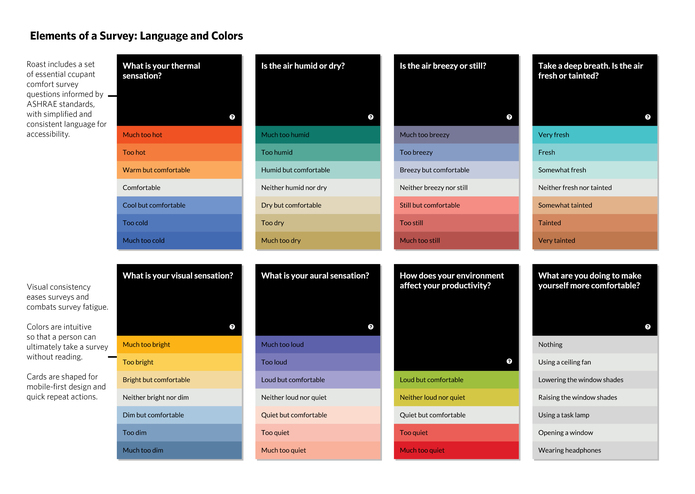 Colors are intuitive so that participants can ultimately take surveys without reading. Roast can be used on desktop, mobile, and tablet devices to increase response rates. Pre-populated survey questions and answers are influenced by ASHRAE and other industry standards. Responses are mapped to a floorplan of your space so that you can analyze correlations between a respondent's comfort and location. We know how temperamental buildings can be. Sometimes we sweat, sometimes we shiver, and a lot of times we complain. 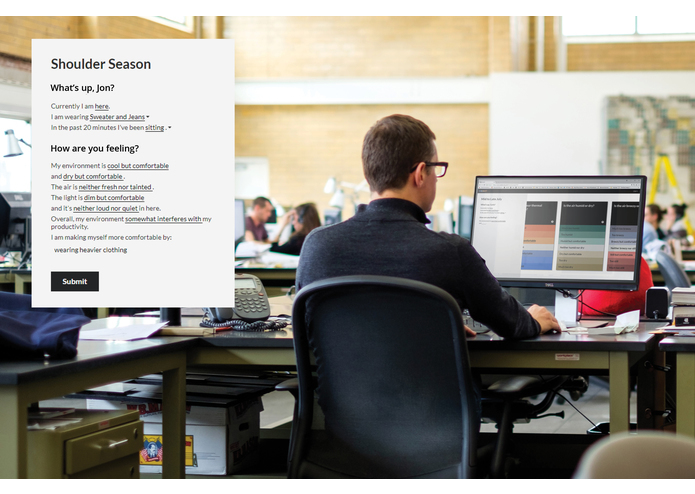 That’s why we developed Roast, a web-based application that lets you create, manage, and analyze occupant comfort surveys so that you can make informed improvements. Created with ASHRAE, LEED, and WELL standards in mind, Roast measures comfort using a range of factors including temperature, humidity, personal activity level, air quality and movement, cleanliness, and visual and auditory stimulation. Roast also helps you dig into the factors that contribute to or detract from occupant comfort, such as access to a fan, the impacts of a skylight, or a truck idling next to an open window. 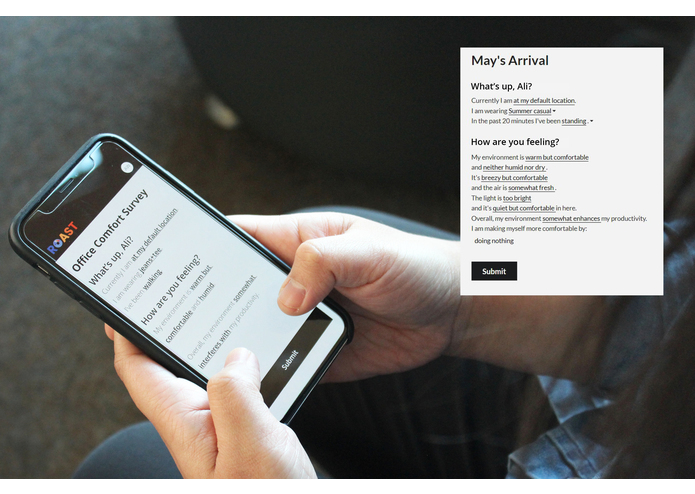 Administrators can include any or all of these questions in customized surveys whose results can be filtered, analyzed, and shared directly in the app. 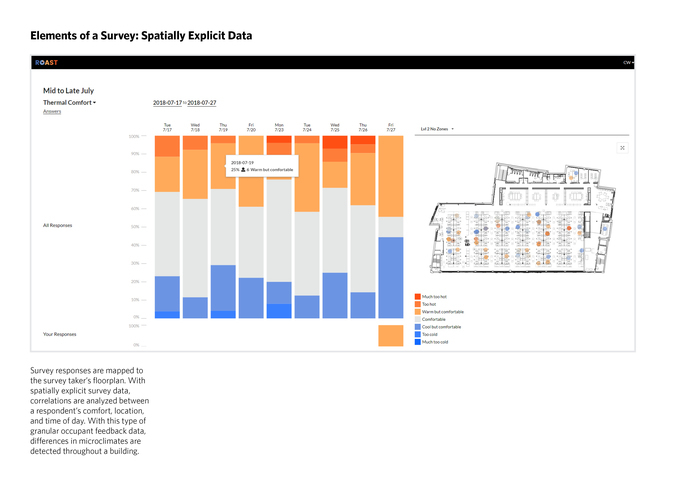 And unlike other survey tools, Roast responses are mapped to a floorplan of your space so that you can quickly analyze correlations between a participant’s comfort, location, and the time of day. With this type of granular occupant feedback, you can identify trends, understand potential problem areas, choose the right setpoint for your building systems, and fine tune your operational strategy. Whether you’re a building owner, facility manager, architect, or human resources officer, Roast takes the guesswork out of occupant comfort. The intuitive interface and pre-populated questions and answers mean you don’t need any prior experience with or knowledge of survey methods to get started. By creating a space that adjusts to its occupants, and not the other way around, Roast can help you save money, reduce turnover, and use less energy.